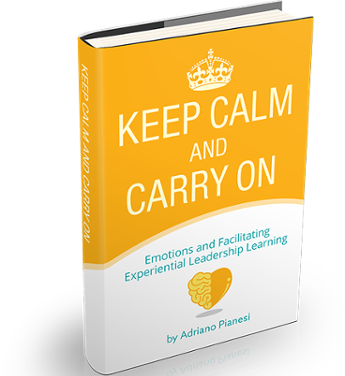 Emotions as important for learning came to the fore after the publication of Goleman’s Emotional Intelligence in 1995. Since then, many insights from neuroscience have clarified the critical role that emotions play in the learning process. Step two of Jack Mezirow’s ten-step transformative learning process is “self-examination with feelings of guilt or shame.” And in Chris Argyris’s Action Science, when analyzing the discrepancy between theory-in-use and espoused theory, a critical step is exploring the reasons for the feelings evoked. Two key ideas are worth mentioning here: Ronald Heifetz’s idea of learning “below the neck,” from the theory of Adaptive Leadership, and to Peter Vail’s idea of “feeling learning” from his book Learning as a Way of Being. The truth is that some participants walk into class ready and expecting to learn only “above the neck”. When it turns out that the work required for their next level of personal development is predominantly “below the neck”, when people realize that the work in the class will be done at a different level, they feel disappointed or discouraged. This disappointment generates anxiety, and the fear they experience can impair their ability to learn, if left unmanaged. People are ready for facts and methods—not for the reality of an experiential class. So people resist the learning and check out. What does it all mean for managing our team or for teaching our next class?